These delicious pear and blueberry pie bars have all the wonderful flavors of a fresh-baked summer pie, but require much less work as well as less oven time. Whip up a batch for a potluck or even as a weeknight dessert (just add vanilla ice cream). Store the extra bars in the fridge—they make an easy and delicious breakfast or a grab-and-go snack—not to mention they contain fiber and antioxidants, thanks to the fresh pears and blueberries. Preheat the oven to 350 degrees. Prepare a 9×13 baking dish by lining it with parchment paper (this will make the bars much easier to remove from the pan later). Combine all of the crust ingredients in a food processor and pulse about 10 times until the mixture has a mealy texture. Scatter the meal in an even layer across the bottom of the pan and then press it firmly into place to form the crust. Dock the crust with a fork all over to prevent rising, and place in the oven to bake for 10 minutes. 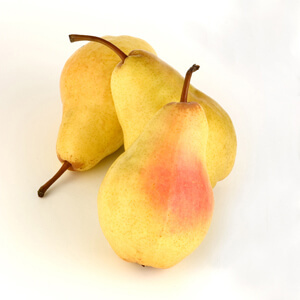 While the crust is baking, peel and slice the pears and toss them very gently with the lemon juice. When the crust comes out of the oven, allow it to cool slightly while you prepare the streusel topping. For the streusel, combine all of the ingredients except the oats in a food processor and pulse about 10 times. Transfer the mixture to a medium bowl and add the oats, thoroughly combining them into the mixture using your hands. Transfer the streusel topping to the refrigerator to chill. 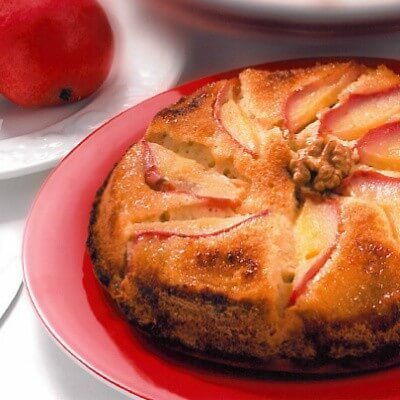 While the streusel chills, assemble the filling by first laying the pear slices out on top of the crust in a single layer. They may overlap slightly if necessary. Next, scatter the blueberries over the pears evenly. Lastly, crumble the chilled streusel over the top of the fruit. Transfer to the oven and bake for 40-50 minutes, or until the blueberries are bubbling and the streusel has lightly browned. Allow the bars to cool for at least 30 minutes before carefully removing them from the pan. For best results, cool the bars fully before slicing into squares (but of course you’ll want to try a few while they’re still warm!). Store in the refrigerator.